Eating more real foods can be really simple when you include homemade salad dressing. They are very easy to make and you control of the ingredients. Of course I had to include dressings in this real food series. 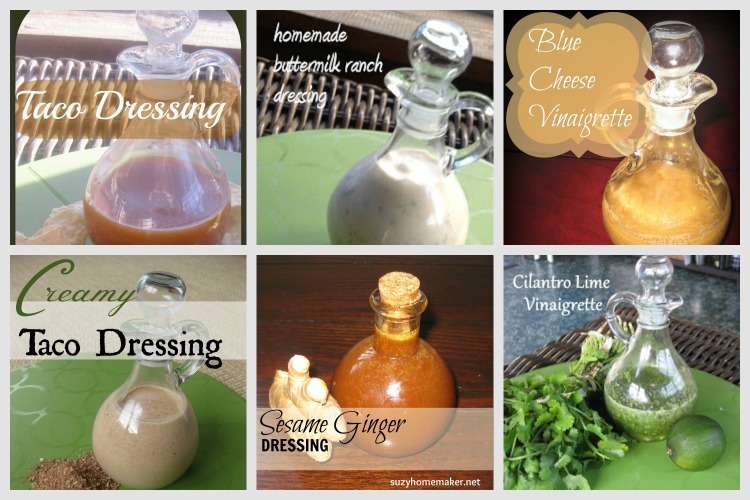 I was on a homemade dressing kick for quite a while and now have about 20 different salad dressings (and some bonus sauces) on the dressings and sauces page. 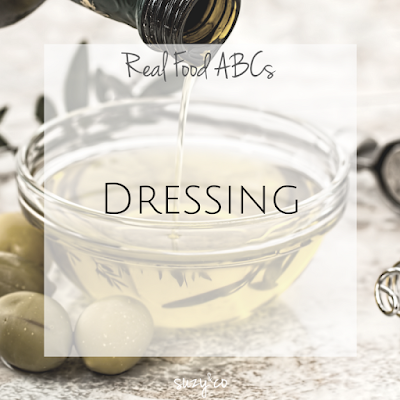 Why make your own dressings? Because many of the ingredients in store-bought dressings are both unhealthy and unnecessary. Vegetable Oil (Soybean and/or Canola), Water, Egg Yolk, Sugar, Salt, Cultured Nonfat Buttermilk, Natural Flavors (Milk, Soy), Spices, Less Than 1% of: Dried Garlic, Dried Onion, Vinegar, Phosphoric Acid, Xanthan Gum, Modified Food Starch, Monosodium Glutamate, Artificial Flavors, Disodium Phosphate, Sorbic Acid and Calcium Disodium Edta As Preservatives, Disodium Inosinate and Disodium Guanylate. Water, Vinegar, High fructose Corn Syrup, Salt, Contains Less Than 2% of Dried Garlic, Soybean Oil, Garlic, Modified Food Starch, Xanthan Gum, Dried Onions, Dried Red Bell Peppers, Spice, Yellow 5, Yellow 6, With Potassium Sorbate. There is some MSG, colorings, high fructose corn syrup, and artificial flavors. No thank you! Most of the dressings on my site, and on others' blogs as well, are simple. The nice thing about making your own dressings is that after you do it a couple times, it becomes very easy to just throw one together with whatever ingredients you have in your kitchen. It is a great way to start your real food journey.